Provides insights from Maury Harris, named amongBloomberg's 50 Most Influential People in Global Finance. Demonstrates "best practices" in the assembly andevaluation of forecasts. Harris walks readers through thereal-life steps he and other successful forecasters take inpreparing their projections. These valuable procedures can helpforecast users evaluate forecasts and forecasters as inputs formaking their own specific business and investment decisions. Emphasizes the critical role of judgment in improvingprojections derived from purely statistical methodologies.Harris explores the prerequisites for sound forecastingjudgmentâa good sense of history and an understanding ofcontemporary theoretical frameworksâin readable andilluminating detail. Addresses everyday forecasting issues, including thecredibility of government statistics and analyses, fickleconsumers, and volatile business spirits. Harrisalso offers procedural guidelines for special circumstances, suchas natural disasters, terrorist threats, gyrating oil and stockprices, and international economic crises. Evaluates major contemporary forecastingissuesâincluding the now commonplace hypothesis ofsustained economic sluggishness, possible inflation outcomes in anenvironment of falling unemployment, and projecting interest rateswhen central banks implement unprecedented low interest rate andquantitative easing (QE) policies. Brings to life Harris's own experiences and thoseof other leading economists in his almost four-decade career as aprofessional economist and forecaster. Dr. Harris presents hispersonal recipes for long-term credibility and commercial successto anyone offering advice about the future. 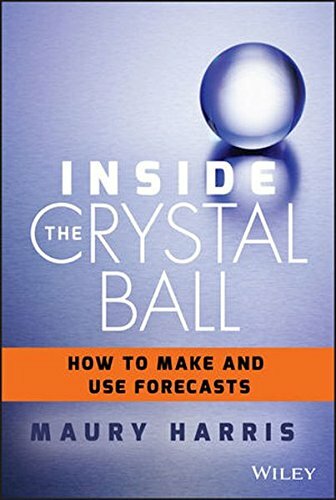 About: A practical guide to understanding economic forecasts In Inside the Crystal Ball: How to Make and UseForecasts, UBS Chief U.